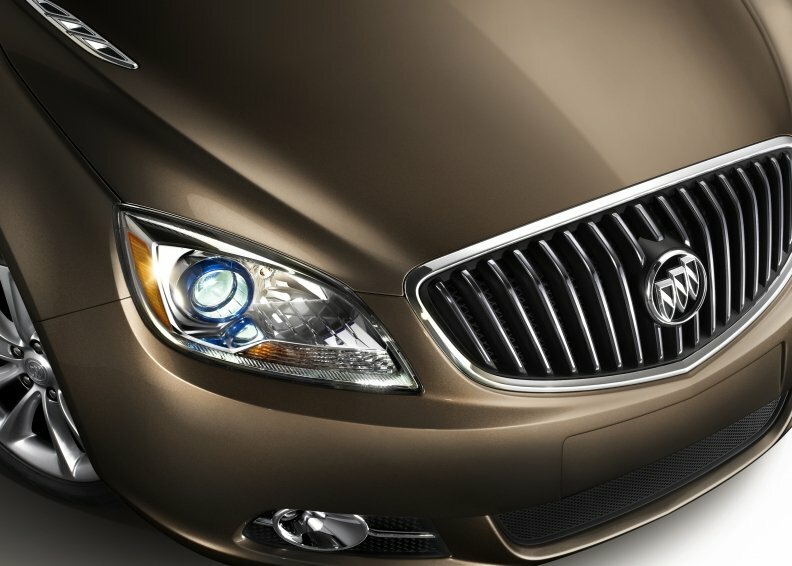 A teaser shot of the new Verano sedan. DETROIT -- General Motors Co. will spend $145 million to build a new Buick compact car -- the Verano -- at its Orion Township assembly plant north of Detroit. The new Buick sedan will join the Chevrolet Aveo subcompact to be assembled at the factory. Under a new labor agreement, GM says the Aveo will be the first profitable subcompact car to be built in the United States. The company said the tooling needed for the Verano and Aveo will be installed by summer 2011. Production will begin in the second half of the year. Both vehicles will go on sale as 2012 models. GM North America President Mark Reuss, who once worked at the Orion Township plant as a body shop robot programmer, said today the Verano will be Buick's first compact car in 20 years. Reuss said U.S. consumers have an appetite for a premium small car that delivers good fuel economy without giving up creature comforts. "This will be Job 1 in this resurgence," Reuss said at a news conference announcing the project and labor agreement at the Orion plant. GM is spending $600 million to prepare the plant to build the Aveo and Verano. The Verano shares the same platform as the Chevrolet Cruze compact, which recently went into production at Lordstown, Ohio. Reuss said he is confident the Buick Verano will impress buyers as much more than a rebadged Chevrolet Cruze. "But we have to demonstrate that," Reuss said. The Verano is designed as a near-luxury compact sedan. Reuss said it will have a "library quiet" cabin, projector headlamps, more chrome accents, and an upgraded interior among several details that will differentiate it from the Cruze. GM is considering changing the name of the Aveo because so many people pronounce it differently, Reuss added. He said the Orion plant will have room to assemble a third vehicle after the Verano and the next-generation Aveo reach full production. He declined to say what that vehicle might be. A UAW source said today the Chevrolet Orlando – a small wagon-like vehicle -- was scheduled to be built at Orion until it was recently cancelled. An innovative labor agreement is making it possible to build the Aveo and Verano profitably. That agreement will pay $28-an-hour wages to 60 percent of the plant's hourly work force -- expected to number 1,500 when the Aveo gets into full production next year. The plant's remaining workers, about 600, will receive a so-called Tier 2 wage of $14 an hour -- including “legacy workers” who will have to take a 50 percent pay cut if they want to remain at the factory. The shop chairman of UAW Local 5960, Mike Dunn, said today that he expected just 100 of the 1,200 workers now laid off while the Orion Township plant is being retooled to come back at the lower wage. Most who choose not to return will transfer to another GM site or retire, he said.